Two new hens joined our flock yesterday (apparently “flock” is only one of the collective nouns for hens – you could also say “brood” or, my personal favourite, “peep”!). They’ve come from a free-range flock of 11,000 hens – a proper commercial set-up, obviously. There, the hens provide 18 months worth of laying, after which point it is assumed that their output will have dropped off and they are sent for slaughter (for cat food or similar rather than for human consumption). In our experience though, they continue laying quite happily for long afterwards, so we’ve saved two from the chop. The two new arrivals seem a bit stunned – understandably. After much thought (see earlier post “What Price Freedom”) we’ve come to the conclusion that the hens are allowed to roam freely in the whole garden when someone is around the house and garden to keep an eye on them, but they are only let out into the run if they are to be unsupervised. This morning, as I was doing a bit in the garden, and I know they like to help, I opened the run gate. 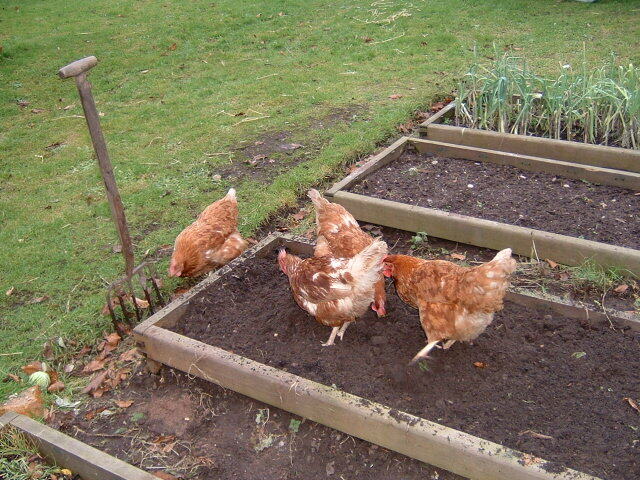 Our ebullient four home hens rushed out to see what I was up to, but the newbies couldn’t be tempted. Still, I’m sure they’ll settle in soon enough and start adding to our egg production as we currently can’t keep up with demand! Of course, having two new additions means hen housing is becoming an issue. OK, that fabulous £3000 gypsy caravan is still out of the question, but it’s certainly time to think about a larger house and run for our expanding “peep”!